This morning a number of my friends spent several frustrating hours attempting to reserve a room at the Marriott Marquis for next summer’s Dragon*Con, as this was the date that the hotel released that block of rooms to the public for purchasing. The sell-out of rooms for Dragon*Con has become a high-stress, high-stakes game for these people, many of whom have been attending the event for more than 20 years. These folks are what I call my “professional” nerds – the kind of people who know what a “real” science fiction convention is like and who lament more and more at what Dragon*Con has become: a very crowded place to be. In 2010 I made a post called “Is Dragon*Con Broken?” in which I listed a number of issues that my friends and I had encountered with the event that year. To their credit, the folks at the convention have stepped up to the plate and made big changes. They’ve been rewarded with more and more fans, and many old-timers are quietly agreeing that the convention is a victim of its own success. It’s become so popular that the QUANTITY of people attending are degrading the QUALITY of the experience. So what’s the solution? We’ve heard lots of suggestions. I hate this one, because many SUPERFANS are also often very poor people. Limiting access based on pocketbook alone would be a short-sighted solution that would lead to further diminishment of the Fan Experience. As a teenager I had limited funds and high-priced tickets would have discouraged me from attending this convention. Still, this is a valid means of throttling the above-capacity crowd (note that when I say “above capacity” I mean that the number of people at the convention is sufficiently high enough to cause uncomfortable crowding) — I don’t have panic attacks, but for the past two years I had to escape the big hotels during the peak of the afternoon on Saturday to reduce my anxiety levels. This one sounds crazy and I have no idea how it would be administered, but the idea is that you’d have to take some sort of test to prove that you are actually a fan of some genre, with significantly nerdy level of knowledge on that topic. I think that I could probably qualify with Doctor Who or Star Trek, so long as we don’t get into esoteric fan fiction. Can you imagine how hilariously embarrassing it would be to find out that somebody couldn’t get in because they weren’t nerdy ENOUGH?? We’ve heard this one batted around for years: move more of the convention to dedicated convention spaces (like the World Congress Center) to separate the people who are there simply to costume and drink from the people who are there to attend tracks and lectures. I’ve always hated this one because I felt that the minute you put people on a bus to go to a different location is the minute that Dragon*Con stops being Dragon*Con. Maybe I’m wrong? I still don’t like it. Decentralization of Hotels, decentralization of con experience? Part of the joy of Dragon*Con for many is the experience of walking out of their room into the madcap costumed hilarity of Nerd Nation, and the reciprocal ability of being able to ESCAPE the sea of poopy pants’d comic book nerds – back to the safety of an air-conditioned room with a private restroom, a bed and a shower. The younger fans are looking to hook up with Slave Leia back in the room, while the older fans are looking to nap after their pancake breakfast with Boba Fett. They don’t have this at San Diego Comic Con (an event that my friend Carl insists you Dragon*Con fans are perpetually “butthurt” about). But, with hotel rooms selling out faster and faster every year, a lot of longtime fans are being forced to look toward the exurbs for rooms, using MARTA’s train lines to bring them the final leg of the journey to Dragon*Con’s crowded corridors. 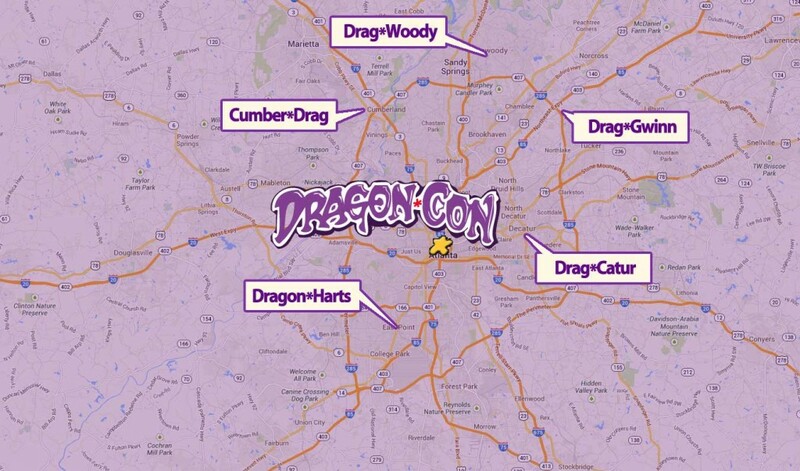 These people are even beginning to plan micro-events at these exurban hotels for their fan-base, to escape the clamor of the Mama Con happening downtown Atlanta… so: exurban micro-convention experience layered atop the true urban Dragon*Con experience. I call these little gatherings “ex-cons” or “X-Cons” and am wondering if this decentralization will gain any momentum in the next five years as more long-time fans decide to forego their beloved Dragon*Con for a more satisfying experience. I’ve noted an increase in the number of friends who are long-time fans declaring that they’ll be “taking a break from ‘Con” next year. I wonder how many will actually manage to stay away or participate in X-Cons? And this is my final question, to which I don’t have an answer or even an opinion: should Dragon*Con itself begin moving outward from Downtown? Should certain events take place off-site? Like synchronized croquet at the Olympics, Dragon*Con rolls dying and dead fandoms off its rolls simply to preserve it’s already limited space. Would the convention do well to actually create its OWN X-Cons on the perimeter of town in order to grow the brand? 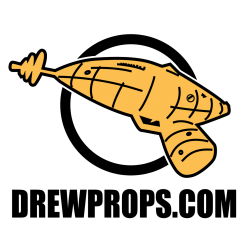 Perhaps those Dragon*Con-branded X-Cons could happen at different times during the year, to remove the burden from the Main Event on Labor Day weekend? Of course, knowing the way that things work, it would probably just increase the number of people who want to attend Dragon*Con in August.